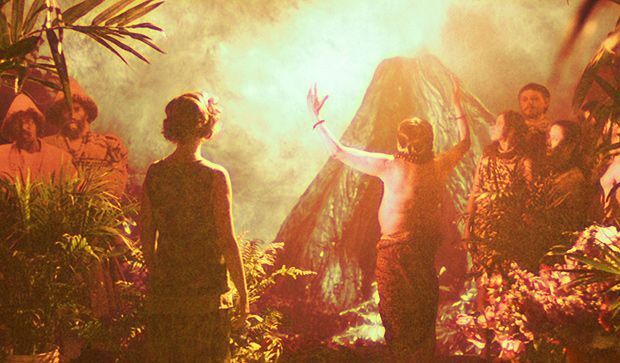 Poisonous leotards and frightening flapjacks are just a taste of the magnificent madness on display in Guy Maddin's The Forbidden Room. A swirling, mutating apparition conjured from a crazed mind, this fluid and delirious film showcases a wealth of imagination as it drags us down through ever deeper, ever stranger layers of storytelling, shaped by splashy intertitles and brought to life by game performers. Bookended and punctuated by segments from the hilarious 'How to Take a Bath' (written by John Ashbery, performed with camp relish by Louis Negin), the fables that unfold are too numerous and colourfully convoluted to fully do justice to here. They include that of four terrified submariners who have lost their captain and are tasked with guarding the mysterious 'blast jelly', a highly explosive substance that's fast melting; the sad story of a man (Udo Kier) who will do anything to curb his insatiable desire for women's bottoms, described in the specially composed Sparks song 'The Final Derriere'; and the tale of lumberjack Cesare (Roy Dupuis), an intrepid hero who heads out to rescue fair Margot (Clara Furey) from Mergel's Cave, the lair of the Red Wolves – and who, once there, is subjected to a series of bizarre trials. Featuring actors of the calibre of Charlotte Rampling, Geraldine Chaplin, Mathieu Amalric and Maria de Medeiros, like the ordeal of the seamen aboard The SS Plunger, The Forbidden Room is a discombobulating, almost suffocating experience as story springs from story, before we breathlessly claw our way back to the surface. Canadian director Maddin is known for his love affair with the techniques and stylistic quirks of early cinema, in films as wonderfully witty and varied as My Winnipeg, The Saddest Music in the World and Dracula: Pages from a Virgin's Diary. Odd though it may sound, his latest (co-directed with Maddin's former student Evan Johnson) started life as a museum installation when Maddin and his collaborators set about reimagining lost movies by shooting a short a day. The Forbidden Room confidently plunders the past but explodes onto the screen in fireworks of vivid colour. It's an acid-infused effort that's both archaic and innovative, silly and searing. If watching it is entirely overwhelming, it's an experience like no other. Screening on Fri 11 Dec as part of the London Film Festival 2015. General release TBC.